One of the very first self acting mortising machines. Designed by Mark Brunel and built by Henry Maudslay 1808. Prior to 1805 all mortises used hand power to cut the slots. 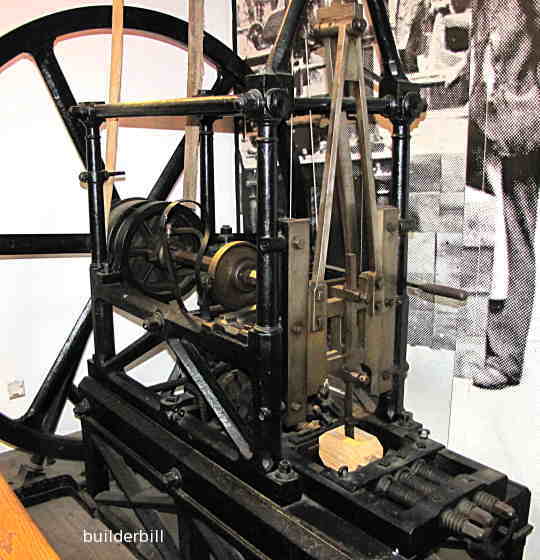 There were some quite sophisticated hand mortise "machines" that improved speed and accuracy before that; but machines like this one installed at Portsmouth Royal Dockyard for making the blocks for rigging sailing ships, were the very first true automated mortising machines. See one of Brunel's boring machines here. These early machines relied on a heavy conventional chisel pounding up and down similar to the hand mortising machines. In the early days there were two basic ways of of cutting a mortise by hand. Blind mortising. Which is basically belting a large heavy and deep in cross section mortise chisel repeatedly into the wood, stopping from time to time to lever the waste out of the hole with the chisel. Drilled mortising. This consists of drilling a series of hole through the timber first, before using a chisel. This greatly enhances the speed of the work. Brunel mortiser : A layshaft, plain smooth pulleys and leather drive belts. Stott Park bobbin mill, Cumbria UK. 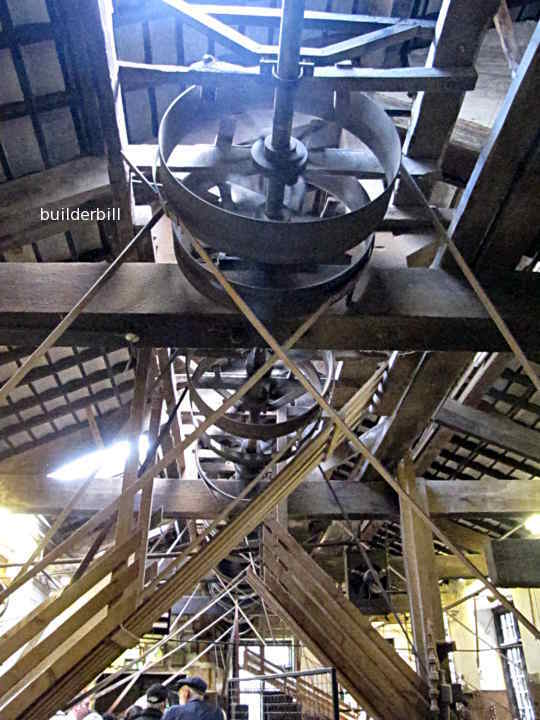 These early industrial revolution machines where driven by water or steam power. The drive shaft from the power source was linked to the factory layshafts via a leather belt. The simple action of knocking off the main drive belt would remove power from all the factory machines. (Leading the origin of the term "knocking off time" etc. Brunel use the drilled mortising technique with this machine. the rest was automatic. The operator placed the pre drilled block in the chuck. Movement of a clutch lever connected the machine to a leather belt from a layshaft. The machine now works automatically. Two chisels were used on each machine so that either one double block (with twin mortises) or two smaller blocks were worked on. The chisels thumped up and down 400 times per minute. The vise or chuck was mounted on a carriage that advanced 1/24 of an inch for each chisel stroke. The carriage was stopped automatically at the end of the pre set distance. The mortise length. So a 4" long mortise was cut in 15 seconds.